High quality child care improves children's experiences and developmental outcomes and also contributes to a prepared, productive, and stable current and future workforce. Practitioners who work in child care settings are responsible for the quality of care and early education provided to children and their families. The Illinois Department of Human Services (IDHS) is mandated by legislative rule 20 ILCS 505/5.151, to conduct a survey of the workforce in licensed child care facilities every two years. The survey summarized in this report meets that mandate by documenting the following: (1) the number of qualified caregivers attracted to vacant positions and any problems encountered by facilities in attracting and retaining capable caregivers; (2) the qualifications of new caregivers hired at licensed child care facilities during the previous two-year period; and (3) the average wages and salaries and fringe benefits paid to caregivers throughout the State computed on a regional basis. Collection of survey data began with the list of 11,295 licensed child care programs in Illinois (3,203 licensed child care centers and 8,092 licensed day care homes) obtained through the Illinois Network of Child Care Resource and Referral Agencies (INCCRRA). On February 8, 2017, providers with email addresses were sent an invitation to participate in the survey. This was followed by a letter mailed to all providers (including those that already received an email) on February 27, 2017. The survey was available in two formats: on-line and a paper document. Out of the 11,295 licensed programs, 666 child care centers (response rate = 20.8 percent) and 987 family child care home providers (response rate = 12.2 percent) completed the survey. In addition, the 2017 report includes administrative data from the Gateways to Opportunity Registry. Because of the substantial population of licensed child care center staff and licensed family child care providers in the Registry, these administrative data are the best source for analysis of staff qualifications and salaries. The findings of this 2017 survey and analysis of administrative data profile the qualifications, salary and benefits, and turnover rates from the sample of licensed child care programs operating in Illinois as of December 31, 2016. The average licensed capacity of centers was reported as 90 children. 525 other types of staff. 27 (4.1 percent) were accredited by the National Accreditation Commission (NAC) under the auspices of the National Association of Child Care Professionals (NACCP). 1 (0.2 percent) was accredited by the Council on Accreditation (COA). 2Three centers held accreditation from two organizations, so the sum of centers by accrediting organization will be larger than the overall "n" of accredited centers. 328 (49.2 percent) of programs had received the Licensed Circle of Quality. 86 (12.9 percent) of programs had earned a Bronze Circle of Quality. 126 (18.9 percent) of programs had earned a Silver Circle of Quality. 126 (18.9 percent) of programs had earned a Gold Circle of Quality. 1.6 percent had completed a Child Development Associate (CDA) or Child Care Professional (CCP) credential. 9.5 percent of early childhood teachers with a bachelor's degree or higher reported they also held a Professional Educator License (PEL) with an early childhood endorsement. The median hourly wage for a full-time early childhood teacher was $12.50 per hour, which is approximately equal to $26,000 per year. The median hourly wage for a full-time early childhood assistant teacher was $10.00 per hour, which is approximately equal to $20,800 per year. 3Assumes 40 hours per week, 52 weeks per year. 51.1 percent of centers offered health insurance for their staff. 44.8 percent of centers offered retirement/pension coverage for their staff. 43.8 percent of centers offered life insurance. 42.8 percent of centers offered dental insurance. 39.7 percent of centers offered disability insurance. 91.4 percent of centers provided paid vacation leave for staff. 91.3 percent of centers provided paid holiday leave for staff. 78.7 percent of centers provided paid sick leave for staff. The turnover rate for early childhood teachers over the last two years increased from 27.2 percent in 2015 to 33.6 percent in 2017. The turnover rate for early childhood assistant teachers over the last two years increased from 34.2 percent in 2015 to 39.1 percent in 2017. Administrative directors had been employed at their current program an average of 9.8 years and early childhood teachers had been employed an average of 5.1 years. The top reason for early childhood teachers to leave their jobs willingly was dissatisfaction with pay or benefits, followed by personal/family issues, and being unhappy with job duties. The least important reasons for an early childhood teacher to leave their job willingly were retirement and not enough opportunities for professional development or growth. Directors reported that it often took more than 4 weeks to fill IDCFS positions; there was very little difference by type of position being filled. The average license capacity reported for family child care homes was 9.8 children, with providers reporting that they care for an average of 7.8 children in a typical week. 5.4 percent (n = 53 out of 987) of family child care providers were accredited through the National Association of Family Child Care (NAFCC). All responding family child care providers participated in ExceleRate. 88.4 percent (n = 873) had received the Licensed Circle of Quality. 4.9 percent (n = 48) had earned the Bronze Circle of Quality. 5.7 percent (n = 56) had earned the Silver Circle of Quality. 1.0 percent (n = 10) had earned the Gold Circle of Quality. 43.3 percent had some form of college education. 36.7 percent had an Associate's degree or higher. 12.8 percent had an Associate's degree or higher in either early childhood education or child development. 0.7 percent reported that they had a public school early childhood professional educator license (PEL). 25 percent of family child care providers make less than $3,650. 50 percent of family child care providers make less than $12,000. 75 percent of family child care providers make less than $22,000. 75.9 percent of family child care providers required payment when closed for holidays, 48.1 percent required payment when closed for vacation, 31.2 percent when closed for sickness, and 18.6 percent when closed for training. 94.5 percent of family child care providers were covered by some form of health insurance. 59.4 percent of family child care providers contributed to Social Security and 29.4 percent set aside money for retirement. 24.8 percent of family child care providers had received some form of public assistance in the preceding two years. Family child care home providers reported an average of 16.2 years of experience taking care of children in their homes. 31.5 percent of licensed family child care providers reported that they had been previously employed in a child care center or public school. 40.3 percent of family child care providers considered quitting providing care in the preceding two years. Dissatisfaction with benefits was the primary reason endorsed. 35.0 percent of family child care providers report they plan to leave child care within an average of 8 years. On average, family child care providers were paid to care for children 50.7 hours per week. On average, family child providers spent an additional 16.0 hours per week on aspects related to their child care business (preparing food, shopping, cleaning, record keeping and lesson planning). Family child care practitioners endorsed "enjoy teaching children" and "like to be in business for self" as their two primary motivating factors for providing child care. the average wages and salaries and fringe benefits paid to caregivers throughout the State computed on a regional basis. Other areas assessed by the survey include information pertaining to fiscal management, enrollment patterns, staffing patterns, staff turnover rates, and professional development. IDHS contracted with the Illinois Network of Child Care Resource and Referral Agencies (INCCRRA) to conduct the Fiscal Year 2017 (FY 2017) survey. One version of the Salary and Staffing Survey was constructed for licensed child care centers, and a separate version was used for licensed family child care providers. To allow for the comparison of 2017 survey results with those from past survey years, questions from past surveys were retained with some minor changes in formatting and wording. Respondents could opt to take the survey either on-line, via the internet, or as a mailed paper document. Formatting and instructions differed slightly between the two forms of administration; survey content remained the same. To create the on-line version of each survey, the paper versions were directly transcribed on-line, using the web-based SurveyMonkey product (surveymonkey.com). Respondents could access the surveys through a link on the INCCRRA website. The Salary and Staffing Survey web page contained links for both the licensed child care center and licensed family child care home surveys. It also included information on how to access both the online and paper versions of the survey, "Frequently Asked Questions" about the survey, and a link to "Previous Survey Highlights." To maintain confidentiality, respondents were assigned a user code (a randomly generated ten-character code). This code was required to enter in order to access the survey. With their unique code information, respondents could enter and exit the survey at their convenience, take the survey at their own pace, and make changes to responses prior to submission. Respondents could request a paper copy of either the licensed child care center survey or the licensed family child care home survey by emailing or calling INCCRRA. Along with the requested survey, respondents would receive a self-addressed stamped envelope in which to return the survey. Appendix A contains the paper versions of both the licensed child care center and licensed family child care home surveys. 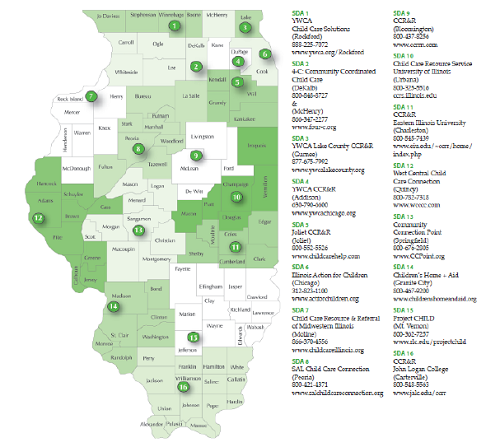 There are sixteen Child Care Resource and Referral (CCR&R) agencies in Illinois (see Appendix B) which together serve all 102 counties in Illinois. Each CCR&R is assigned one or more counties to cover (referred to as their Service Delivery Area or SDA). All CCR&R agencies are partners with INCCRRA, which provides coordination and supports for the Illinois CCR&R System. CCR&Rs support licensed and license-exempt child care centers and family child care homes in their assigned areas. Child care facilities in Illinois are licensed by the Illinois Department of Children and Family Services (IDCFS). Local CCR&Rs list these IDCFS licensed child care facilities on a provider database called NACCRRAware. INCCRRA maintains this database for Illinois. All 11,295 facilities in Illinois (3,203 licensed child care centers and 8,092 licensed family child care homes listed in the database as providing care as of December 31, 2016) were invited to participate in the survey. On April 6, 2017, reminder postcards were sent to 10,382 providers (7,536 family child care home providers, 2,846 centers). These postcards thanked providers who had completed the survey, reminded providers of the survey's availability both online and as a paper document, and provided the contact information necessary for providers to obtain the paper copy of the survey if so desired. Analyses were based on all completed surveys returned by July 1, 2017. A total of 8,092 IDCFS licensed family child care home and group home providers and 3,203 centers were invited to complete the Salary and Staffing Survey. Out of these, 987 family child care/group home providers (903 online; 84 paper) and 666 center directors (653 online and 13 paper) completed and returned the survey. The response rates for each type of program were 12.2 percent and 20.8 percent respectively. A discrepancy in the number of responses to each question exists because not all respondents completed each question. The number of raw responses to a question is denoted by the symbol (n or n =). n (lowercase) - the number responding to a single question (in this dataset n = 13) whereas N (uppercase) is the number of respondents in total for the survey. Respondents sometimes skip a question or it is inapplicable so the n for each question or analyses is noted. MEAN - the average, the result of adding all values in a data set and dividing by the number of values. Means are sensitive to each number in a data set but can be easily affected by extreme values. In the example data set above, the mean is calculated as: (1+2+2+2+3+3+4+5+6+6+7+8+99) ÷ 13 = 11.23. If the extreme value, 99, was to change to 9, the mean would change dramatically, (1+2+2+2+3+3+4+5+6+6+7+8+9) ÷ 13 = 4.31. MEDIAN - the number that falls in the center of a list of data when scores are ordered by value. The median is not affected by the relative size of extreme scores. The median in the data set above is 4. Changing the 99 to 9 has no effect on the median. MODE - the number that occurs most frequently in a group of scores. The mode in the data set above is 2. RANGE - the range is the difference between the highest and lowest score. In the sample data set the range is (1-99). The term "child care center" encompasses an assortment of programs that have their own legal and regulatory status as well as funding sources. Types of programs include full-day/full-year center-based child care programs, preschool programs, nursery schools, state-funded Preschool for All pre-kindergarten programs, Head Start/Early Head Start programs, and school-age care programs. Staff qualifications and training requirements vary with the type of program. "Legal status" indicates for-profit or not-for-profit; "regulatory status" refers to licensed or license-exempt. Source of capital includes public and/or private funding sources. Public funding sources include, but are not limited to: Illinois Department of Human Services (IDHS) vouchers, certificates or site contracts, the Chicago Department of Family Support Services site contracts, Illinois Department of Children and Family Service (IDCFS) vouchers or certificates, Head Start, State Board of Education (ISBE)/Preschool for All (PFA), Child and Adult Child Care Food Program, and municipal, state or federal grants. Examples of private funding sources include tuition-based (parent fees), private donations, grants from foundations or agencies such as the United Way, corporate or employer subsidies and fundraisers. Some centers are independent and stand-alone enterprises - either for-profit or non-profit; some are part of a corporation or chain (or are corporate-sponsored), and some are affiliated with a social service agency, hospital, or college or university. Others are sponsored through funds from the federal, state, or local government or are affiliated with the public school system. Some are single-site programs and others are multi-site programs. All of these types of centers represent variation in child care delivery that is considered in the survey analyses. From the 3,203 invitations sent to child care centers, 653 online surveys were completed and an additional 13 paper surveys were completed. Thus, 666 center surveys were completed out of 3,203 delivered invitations, for a response rate of 20.8 percent. Table 1 presents the response rates by CCR&R service delivery area (SDA) (see Appendix B). Respondents were asked to provide basic information about their programs. Out of 666 centers responding to the survey, 56 (8.4 percent) were completed by owners, 142 (21.3 percent) by owner/directors, 379 (56.9 percent) by administrative directors (including CEO and executive director), 65 (9.8 percent) by director/teachers, 12 (1.8 percent) by support staff, and 10 (1.5 percent) by other personnel including teachers and fiscal officers. Since the majority of respondents to the licensed child care center survey were directors in some form (88.0 percent), all respondents will henceforth be referred to as "directors". Directors were queried about their programs, specifically: (1) hours of operation/program type; (2) whether it is sponsored by a faith-based organization; and (3) whether it exists as a single or multi-site program. Data from the NACCRRAware database provided information as to whether the center was an accredited program and whether it has been awarded a Circle of Quality in the ExceleRate Illinois Quality Recognition and Improvement System (QRIS). 0.3 percent (n = 2) programs did not identify their type of center. When asked whether their centers were sponsored by a faith-based organization, 507 directors (76.1 percent) responded "No", 156 (23.4 percent) answered "Yes", and 3 (0.5 percent) did not answer the item. Directors were also asked whether their program was a single-site program or part of a multi-site program. Nearly three-quarters (72.8 percent, n = 485) indicated that their program was a single-site program; 26.6 percent (n = 177) were part of a multi-site program, and 0.6 percent (n = 4) did not report whether or not their center was single or multi-site. Accreditation demonstrates a center's commitment to high quality in early care and education by meeting voluntary guidelines and standards established by national accrediting organizations. The ExceleRate Illinois Quality Recognition and Improvement System (QRIS) is designed to make continuous quality improvement an everyday priority among early learning providers.5 Providers who care for children eligible for the IDHS Child Care Assistance Program (CCAP) also receive a quality bonus above the standard payment rate if they achieve an ExceleRate Illinois Circle of Quality above the Licensed Circle of Quality. Using information from INCCRRA's databases, variables were created to indicate the accreditation and ExceleRate Illinois rating status of licensed centers participating in the salary and staffing survey. Please note that centers can simultaneously hold a Circle of Quality and be nationally accredited. Of the 338 centers that had achieved a rating above the Licensed Circle of Quality, 35.8 percent (n = 121) were also nationally accredited. 6Three centers held accreditation from two organizations, so the sum of centers by accrediting organization will be larger than the overall "n" of accredited centers. 7To further identify the prevalence of accredited centers in Illinois, data were accessed from NACCRRAware in July 2017 and showed that: 379 (11.9 percent of all Illinois centers) are NAEYC accredited, 101 (3.2 percent of all Illinois centers) are NAC accredited, 29 (0.9 percent of all Illinois centers) are NECPA accredited, and 4 (0.1 percent of all Illinois centers) are COA accredited. Overall, 15.8 percent of all center programs in Illinois have been accredited by national organizations and meet nationally recognized standards for high quality. 8According to data retrieved for all programs from INCCRRA's Data Tracking Program (DTP), on July 1, 2017: 48 percent of centers were at the Licensed Circle of Quality, 7 percent were at Bronze, 20 percent were at Silver, and 25 percent were at the Gold Circle of Quality. To assess center program revenues, directors were asked to describe the legal status of their center, list center funding sources, estimate the contribution of each funding source to the center's overall budget, and provide totals on center revenue, operating budget, and net profit. 6 (0.9 percent) of center directors did not respond to this item. Next, center directors were provided a list of funding sources and asked to indicate which ones their center currently received. Table 2 identifies each revenue source and the percentage and number of centers who reported receiving it. As Table 2 reveals, 92.3 percent of all centers stated a portion of their funding base was comprised of tuition-based/parent fees. Illinois Department of Human Services (IDHS) vouchers or certificates were the second most common source of funding (68.9 percent). Table should be read: "92.3 percent of licensed child care centers received tuition-based revenues." 1Percentages add up to greater than 100 percent as respondents were asked to endorse all items applicable to their programs. Not only were directors asked to identify the various sources of funding which comprised their center's revenue base, but they were also asked to estimate the percentage that each funding source contributed to their general revenue. Tuition and parent fees were reported to be the most common source of funding for centers (92.3 percent), with tuition and fees comprising an average of 62.9 percent (n = 596, median = 75.0 percent) or slightly less than two-thirds of center revenue. The average and median percentages for each additional funding source for the 596 centers who answered the question are provided below. Head Start funds comprised 5.4 percent of the total revenue base (median = 0.0 percent). Preschool for All funds made up 1.8 percent of the revenue base (median = 0.0 percent). Public funding (state, federal, or local) comprised 25.2 percent of the overall revenue base (median = 10.0 percent). Private donations and gifts were 2.7 percent of the funding base (median = 0.0 percent). Corporate/employer subsidies were 0.6 percent of total revenue (median = 0.0 percent). Directors were asked to approximate both the annual operating costs and annual income for their centers. A wide range of budgets emerged. Annual operating expenses averaged $482,033 (n = 443), with a median of $360,000. Annual revenues averaged $512,398 (n = 443) with a median of $369,478. To calculate net profit, annual expenses were subtracted from annual revenues. Again, a notable range in net-profit existed between the centers; however, the average profit per center was $30,365 (n = 443). As stated previously, the term "child care center" encompasses an array of programs and facilities such as public and private or for-profit and not-for-profit. To report a single figure for revenues or expenses that represents the fiscal experience of child care centers in Illinois obscures the varied nature of child care. Table 3 presents the operating costs, revenues, and profits of licensed Illinois child care centers by profit/nonprofit status and affiliation. The table documents that fiscal outcomes of child care centers are as varied as the centers themselves. Not surprisingly, as with the findings from 2015, corporate for-profit centers generally yield a profit, but public and private nonprofit centers make considerably less. Note: Statistics for which there were fewer than 3 observations were deleted. As with the last three surveys, questions were asked to ascertain whether the general economy was perceived to have affected either the operating costs and/or revenues of centers. Directors were asked to rate these changes on a scale from 1 ("Decreased greatly") to 5 ("Increased greatly"). Directors rated the average change in operating costs as 3.6 (n = 610; median = 4.0) and the average change to revenue as 2.8 (n = 601; median = 3.0). Close to half of the directors that indicated revenues "stayed about the same" noted that operating costs had increased in the last two years. If centers charge private-paying parents more for child care than the child care subsidy program reimburses, the center can ask the parent to pay the difference between the rates (if not a contracted site provider). More than one-third of the reporting centers (41.9 percent; n = 220 out of 525) enrolling subsidized children charge parents more than the amount reimbursed by the subsidy program. Directors were also asked to rate the ease of collecting the parent's share of subsidized child care (parent co-pay plus any difference between state reimbursement and center rate). On a scale of 1 ("Very easy") to 5 ("Very difficult"), responding centers (n = 499) reported an average rating of 3.3 (median = 4.0), indicating that the task was "Neither easy nor difficult." Directors were further asked whether collecting the parent share had gotten easier or more difficult in the past two years (again on a scale from 1 ("Much easier") to 5 ("Much more difficult"). The average rate reported was 3.4 with a median of 3.0, indicating that it had "stayed the same." Licensed capacity is defined as the maximum number of children permitted in the child care facility at any one time. The ages of children that can be enrolled in a licensed center varies between six weeks - 12 years of age and are stipulated on the center's IDCFS license. Of the 665 responding centers with a licensed capacity listed, the mean total licensed capacity was 89.5 children, with a median licensed capacity of 78.0. The average total capacity of reporting centers was somewhat higher than the average licensed capacity of all 3,203 active licensed centers (79 children). When asked to recount their current total enrollment (how many children attended their program), directors (n = 640) reported an average current total enrollment of 91.3 children, with a median current total enrollment of 77.0. Please note that enrollments can exceed total licensed capacity as counts may be made across multiple shifts and/or include children who attend programs on a part-time basis. Directors were asked whether they had children enrolled whose families receive Illinois Department of Human Services (IDHS), Chicago Department of Family Support Services (DFSS), and/or Illinois Department of Children and Family Services (IDCFS) financial assistance (subsidized child care). A preponderance (86.3 percent; n = 552) of centers have children enrolled whose families receive IDHS, DFSS, and/or IDCFS assistance. These centers enrolled an average of 31.3 children (median enrollment of 20.0) whose child care was subsidized by the aforementioned types of assistance. To calculate the percentage of subsidized children enrolled in a center, the number of subsidized children enrolled was divided by the center's current total enrollment (n = 466). On average, 37.0 percent (median = 29.2 percent, with a range of from 0 to 100 percent) or, four out of every ten children enrolled in licensed child care centers, had child care paid through IDHS, DFSS, and/or IDCFS public financial assistance. This was 1.9 percent lower than the FY 2015 Salary and Staffing Survey report of 38.9 percent, and 5.8 percent lower than the FY 2013 report of 42.8 percent. To further explore the enrollment patterns of centers, directors were asked how frequently their programs had vacancies over the past two years. On a scale of 1 ("There are always vacancies") to 5 ("There are never vacancies"), directors (n = 646) reported an average of 2.5 (with a median of 3.0). A rating of 3 means directors observed "there are sometimes vacancies" in their centers. Table 4 displays enrollment patterns. As Table 4 demonstrates, 78.6 percent of all directors rated their vacancy pattern as "There are always vacancies" to "There are sometimes vacancies". This is nearly the same as what was reported in FY 2015, indicating that center directors have experienced vacancies remaining steady in the past two years. It is interesting to note that per the NACCRRAware database, 8.4 percent of all contacted Illinois child care centers that closed their doors between July 1, 2016 and June 30, 2017, closed due to "insufficient enrollment." This is a decrease from the 9.9 percent reported in the FY 2015 report. Directors were also asked to reflect on how enrollment had changed over the past two years. On a scale from 1 ("Decreased greatly") to 5 ("Increased greatly"), directors indicated that on average the change of enrollment was 2.8 (n = 647; median = 3.0). The number 3 on the scale designates that the current enrollment "stayed about the same". A comparison of the data in 2013 and 2015 indicates little change in perceived enrollment patterns. The 609 center directors responding to the item estimated that, on average, 20.4 percent (median = 5.0 percent; range = 0 to 100 percent) of the children in their programs were African-American, 59.0 percent (median = 70.0 percent; range = 0 to 100 percent) were Caucasian/White, 11.1 percent (median = 2.0 percent; range = 0 to 100 percent) were Hispanic/Latino, 0.1 percent (median = 0.0 percent; range = 0 to 25 percent) were Native American, 3.5 percent (median = 0.0 percent; range = 0 to 97 percent) were Asian/Pacific Islander, 4.9 percent (median = 1.0 percent; range = 0 to 80 percent) were multi-racial, and 1.0 percent (median = 0.0 percent; range = 0 to 48 percent) were of other racial/ethnic groups. Over half (56.0 percent; n = 364) of directors indicated that there were children in their programs whose primary language was not English. Directors who reported children in their programs who spoke a language other than English also reported on the other languages spoken by the children in their center. In descending order, the following languages were reported to be spoken by the children. The percent shown in parenthesis represents the frequency of children who speak the indicated language in the 666 centers represented in the 2017 Salary and Staffing Survey. Spanish (42.6 percent) was the predominant non-English primary language spoken by children in the responding centers. Directors were asked to provide information on the number of full-time and part-time staff employed in their center. In order to ensure the uniformity of job titles between the centers, the five staff positions highlighted in IDCFS licensing standards (see Appendix C) were used throughout the survey. The position of center director was separated into two categories to account for directors who double as teachers in their center. Other job categories were also listed in the survey that corresponded to those examined in previous surveys. Table 5 depicts the breakdown of center staff by position as well as the mean number of employees in the positions. 1Number of centers with one or more staff members of the designated title. 2A director/teacher must meet the qualifications of both the director position and the teaching position. The average child care center employs 17.9 staff members, the majority (85.2 percent) in IDCFS-defined positions. Early childhood teachers represented the single largest category of child care staff (41.1 percent of all staff and 48.2 percent of all IDCFS-defined instructional positions). The lead teacher is the individual with the highest educational qualifications assigned to teach a group/classroom of children and who is responsible for daily lesson planning, parent conferences, child assessment, and curriculum planning. Depending on the program, this individual may be called a head teacher, master teacher, or teacher. Each group/classroom will have one, and only one, lead teacher. A total of 605 centers provided information about lead teachers. Child care centers averaged 6.1 lead teachers, with a median of 5.0. This figure remains consistent with findings from 2015 (mean = 6.0; median = 5.0) and 2013 (mean = 6.3; median = 5.0). Table 5 indicates that on average most centers employ one cook and one building support person in their program; however, not all centers have these employees on their regular staff. Of the 666 directors who responded to the survey, 32.4 percent indicated that they contracted for food service, 35.3 percent contracted for building cleaning, 33.6 percent contracted for grounds maintenance, and 6.8 percent indicated that they contracted for other services such as pest control, accounting, and office equipment. To further explore staffing patterns, directors were asked to identify the number of instructional staff with a second-paying job outside of their center. Out of 610 responses to this question, 286 directors answered "I don't know" and 324 (53.1 percent) indicated that at least one member of their instructional staff had a second paying outside job. These directors reported that on average, three (mean = 3.1; median = 2.0; range = from 1.0 to 20.0) of their instructional staff had a second-paying job outside their center. The average number of staff reported to have an outside paying job is consistent with the findings from the last several surveys. Men continue to be underrepresented when it comes to employment in the field of early care and education. According to the U.S. Bureau of Labor Statistics, the 2017 national percentage of men employed as child care workers was 6.3 percent, employed as teacher assistants was 11.5 percent and employed as preschool or kindergarten teachers was 2.3 percent.9 To assess how many males were employed in child care centers in Illinois, respondents were asked to indicate the number of males employed in IDCFS center staff positions. Table 6 presents the number of male staff members employed in each position. While 21.9 percent of centers employed one or more male staff members in an instructional capacity (all positions except administrative director in Table 6), only 2.5 percent (n = 227) out of 8,938 of instructional staff were male. This percentage decreased slightly from the 2015 report. 9Figures were calculated by comparing the number of women in the position to the total number of workers in the position. This produced the number of males in the position. The BLS combines the positions of kindergarten and preschool teachers in their data. Data from, "Household Data Annual Averages", U.S. Bureau of Labor Statistics, https://www.bls.gov/cps/cpsaat11.htm. Table should be read: "Of the 518 centers who had administrative directors, 30 or 5.8 percent had a male administrative director." 2Number of centers with one or more male staff members of the designated title. 3Percentage of centers with one or more male staff members of the designated title. As previously reported, over half of responding centers reported caring for at least one child whose primary language was other than English. In order to gauge staff capacity to speak a language other than English effectively, we asked directors to indicate how many of their staff were fluent in a non-English language. Table 7 presents the results of this inquiry. Just over 16 percent of the 8,938 instructional staff were reported to be fluent in a language other than English (this is nearly the same as what was reported in 2015, but represents an increase from the 14.1 percent reported in 2013 and 10.5 percent reported in 2011). Just over half of all centers (51.1 percent) had at least one instructional staff member who was fluent in a non-English language. This is comparable to the 48.9 percent reported in FY 2015. In descending order, the following languages were reported as spoken fluently by center staff. The percentage of all programs represented in the survey that have staff who speaks that language appears in parentheses. 2Number of centers with one or more staff members of the designated title fluent in a non-English language. 3Percentage of centers with one or more staff members of the designated title who are fluent in a non-English language. Table should be read: "Of the 518 centers who had administrative directors, 85 or 16.4 percent had an administrative director who is fluent in a language other than English." The Gateways to Opportunity Illinois Professional Development System is recognized for promoting quality and professionalism for early care and education, school-age, and youth practitioners. The Gateways to Opportunity Registry is available for practitioners to track their training and professional development. Great START (Strategy to Attract and Retain Teachers) is a wage supplement program that aims to increase child care practitioner retention while encouraging increased levels of education. The Gateways to Opportunity Scholarship Program provides partial funding for college scholarships for both center and family child care providers in an effort to increase the educational levels of practitioners, promote increased practitioner compensation, and improve the consistency of care for children. Gateways to Opportunity awards credentials to practitioners in the field of early care and education, school-age and youth development. The various credentials that can be earned are the ECE Credential, Infant Toddler Credential (ITC), Illinois Director Credential (IDC), Family Child Care Credential (FCCC), School-Age and Youth Development Credential (SAYD), Family Specialist Credential (FSC), and the Technical Assistance Credential. Achievement of these credentials is based on educational level, professional development background and work experience in the field of early care and education. The Professional Development Advisor (PDA) Program pairs experienced mentors with less experienced practitioners to assist the latter in meeting their professional development goals. The Gateways i-learning System is a web-based platform that provides online training opportunities to early care and education professionals. Online trainings offered include those required for IDCFS licensing, ExceleRate Illinois, and Gateways to Opportunity Credentials. ExceleRate Illinois is a statewide quality recognition and improvement system (QRIS) designed to make continuous quality improvement an everyday priority among early learning providers. The program establishes standards for helping children develop intellectually, physically, socially, and emotionally. Local Child Care Resource and Referral Agencies offer various services for child care providers, parents and communities. Services for child care providers include technical assistance, training and consultation from specialists including Quality and Infant Toddler Specialists, and Mental Health Consultants. Directors' awareness of the various professional development opportunities are reported below. 79.6 percent (n = 497) of the 624 responding center directors knew of the consultants/specialists available through their local Child Care Resource & Referral agency. 85.1 percent (n=531) of the 624 responding center directors knew of the online training opportunities available through the Gateways i-learning System. 65.9 percent (n = 439) of all 666 responding centers had at least one Great START recipient in the past two years. Those 439 programs had a total of 1,542 recipients. 37.4 percent (n = 249) of all 666 responding centers had at least one Gateways to Opportunity Scholarship participant for a total of 494 participants. Some directors provided written feedback about these professional development opportunities. Below are representative comments. "I feel that the maximum amount staff can make [$15/hr.] [to qualify for Great START] is too low. I have hard working staff who are dedicated to this program that we pay slightly more than the $15/hr. and they can't receive [a wage supplement]." "ExceleRate Illinois has provided a vast array of opportunities for child care professionals and our centers welcome the challenges. The goal of Illinois should now be to better inform parents of the talents required to successfully work with children in this field…"
According to IDCFS Center Licensing Standards, center directors are responsible for ensuring that each child care staff member receives 15 hours of training each year. Programs that are accredited may have additional requirements beyond the 15 hours of training. A series of questions were devoted to finding out whether a center had a professional development (PD) plan for staff to meet this requirement, and the modes in which staff received training. An interesting finding is that there were notable increases in the percent of directors reporting they have staff professional development plans for their center and for their teaching/instructional staff. The 2015 report revealed 80.3 percent had professional development plans for their center, and 67.1 percent had professional development plans for their staff. These percentages compare to the 79.0 and 67.1 percent, respectively, in this report. Both the 2015 report and this one show an increase over previously reported data (the 2013 report showed 71.0 percent of centers had PD plans for their center and 56.7 had plans for individual staff). One potential reason for this jump is the increased attention on the role of professional development planning as part of continuous quality improvement. In addition to being a primary focus within ExceleRate Illinois, there have been several efforts in Illinois over the last several years to bring greater awareness to continuous quality improvement through regional meetings, training opportunities, and technical assistance. 79.0 percent (n = 492) of the 623 directors who responded to the question reported they have a staff professional development plan for their center. 67.1 percent (n = 418) of the 623 directors who responded reported they have an individual staff professional development plan for their teaching/instruction staff. 95.8 percent (n = 598) of the 624 directors who responded to the question reported they have in-service training opportunities for their instructional staff. 84.3 percent (n = 528) of the 626 directors who responded to the question reported they pay for conference training or registration. 63.1 percent (n = 389) reported their staff had received training at a professional association meeting or conference. 92.9 percent (n=572) reported their staff had received training through an online training source. Directors were also asked whether they believe there are adequate training opportunities available to them and their staff. Of the 623 directors who responded to this question, 79.0 percent believe there are adequate training opportunities available. This is consistent with the responses from 2015 (79.2 percent), which was a large increase over the 60.7 percent who had responded favorably to this question in 2013. A possible explanation may be an increase in the amount of online training that has been made available and/or the use of it. For example, several new trainings were made available in the past several years through the Gateways to Opportunity i-learning System. It is the director's responsibility to ensure center compliance with IDCFS licensing and other regulations, manage the day-to-day operations of the center, be its overall manager, and deal with various challenges on a daily basis. To measure the director's resilience to the nature and scope of issues inherent in his or her position, directors were queried about their support system (contact with other child care professionals). When asked, "Approximately how many other child care professionals in addition to your immediate staff did you speak to last week? ", 59.8 percent (n = 361) of the 604 responding directors reported that in the past week they spoke to no more than two additional child care professionals in addition to their immediate center staff, 20.7 percent (n = 125) reported that they spoke to between three and five additional child care professionals, and 19.5 percent (n = 118) reported that they spoke to six or more additional child care professionals. 14.6 percent (n = 88) directors reported knowing two or fewer child care professionals. When searching for a quality child care arrangement in a center, parents are advised to ask, "What is your staff turnover rate?" A consistent, nurturing caregiver is essential to creating a positive, trusting learning environment for children. That is why a stable workforce is paramount to providing quality child care. In order to understand the factors that comprise a stable workforce, questions concerning turnover rate, applicants, and new hires were posed. Directors were asked to report the number of full-time and part-time staff members who left their program within the past two years. Temporary, substitute, and seasonal staff were excluded. To determine the percentage of turnover rate at the center level, the number of centers with staff exits within the past two years was compared to the number of centers employing staff with the given position. Staff turnover rates at the center level are presented in Table 8. 1Number of centers reporting at least one staff member of the indicated position. See Table 5. Table should be read: "14.3 percent of centers employing administrative directors had one or more administrative director(s) leave their position in the past two years." The percentage of centers experiencing staff turnover in the past two years decreased with regard to turnover in the administrative director and director/teacher positions (14.3 percent and 26.7 percent in 2017 compared to 18.5 percent and 28.3 percent in 2015), and had slight increases for early childhood teacher and assistant positions (70.2 and 59.5 percent in 2017 compared to 67.8 and 61.9 percent in 2015.) Centers experiencing turnover in school-age worker and assistant positions remained fairly consistent. In order to calculate the turnover rate on an individual position level, the number of staff who left in the past two years was compared to the number of employees currently employed. Table 9 displays the percentage of employees who left each position within the past two years. Table should be read: "15.3 percent of administrative directors left their position within the two years preceding the survey." Individual turnover rates for administrative directors and director/teacher positions were fairly consistent with 2015 turnover rates, but turnover rates for early childhood teachers and assistants were notably higher (33.6 and 39.1 percent in 2017 compared to 27.2 and 34.2 percent in 2015). Data regarding the two-year turnover rate by position has been collected since the FY 1997 Staffing Salary Survey (although the turnover rates were referred to as "replacement rates" in all surveys prior to FY 2003). Table 10 offers a comparison of these rates from FY 2007-FY 2017. Table should be read: "For every 100 administrative directors working in FY 2017, 15 administrative directors left in the two years preceding the survey." Turnover rates have increased for early childhood teacher/assistant and school-age worker positions since FY 2015, while turnover rates for other positions remained largely the same. The turnover questions in the 2017 survey were different from past years' surveys in an effort to obtain more reliable data. Previously, directors were asked to subjectively rate (on a 5 point scale from "not important" to "very important") the reasons staff in various positions had turnover. For this survey, we first asked how many staff turned over of their own choice and how many were terminated. Directors reported that 84.8 percent of staff that left their program in the past two years did so voluntarily. Table should be read: "Directors reported that 39.2 percent of Early Childhood Teachers that left in the past two years did so because they were dissatisfied with wages or benefits." * Due to an error made by a director reporting more staff in this category than in the overall number that left. It is apparent from Table 11a that the most significant reasons for staff exit were dissatisfaction with wages or benefits; and personal or family issues, and to a lesser extent, unhappy with job duties. In addition to asking the reason why staff left, directors were asked a follow-up question to determine where the staff that left went - whether they stayed in the field or went into a different field, as shown in Table 11b. Table should be read: "Directors reported that 27.2 percent of Early Childhood Teachers that left in the past two years went to a different child care center." While directors did not know what type of position many of the departing staff ended up going to, it seems that administrative directors, director/teachers, and early childhood teachers frequently went to work at different child care centers. Many staff ended up going to work in positions outside of the field of early care and education, especially staff from the school-age worker and assistant categories. "…most moved on to higher paying jobs to utilize their bachelor's degrees." "The job is hard with lots of responsibilities. Burnout factor is important too. Many day cares have no health insurance or retirement to offer." Directors were asked to respond to a number of items in order to determine how vacant positions are filled, what type of applicants apply, and what attracts applicants to the field. For each job position, directors were asked to report the number of IDCFS qualified applicants, program qualified applicants (e.g., met qualifications to work in Head Start), and non-qualified applicants who had applied for advertised vacancies within the past two years. Table 12 shows the number of applicants who applied for each position and the percentage of applicants qualified (either IDCFS or program qualified) for the position as reported by the 397 center directors participating in the survey. Comparing these results from those of the 2015 survey, the percentage of non-qualified applicants for director and director/teacher positions increased significantly, while the percentage of non-qualified applicants for early childhood teacher positions decreased somewhat. The percentage of IDCFS qualified applicants differed from the 2015 survey depending on position. In FY 2017, 45.4 percent of early childhood teacher applicants were IDCFS-qualified, up from 39.7 percent in 2015. The number of qualified assistant teachers also increased from 59.5 in FY 2015 to 65.2 in this report. Table should be read: "41.7 percent of applicants for administrative director openings were IDCFS-qualified." To document the length of time needed to fill vacant positions, directors were asked to respond to a four-point rating scale of 1 ("Less than one week") to 4 ("More than four weeks"). Directors most often reported that all positions, with the exception of early childhood assistant/aide took more than 4 weeks to fill: administrative director (mean = 3.3; n = 73), director/teacher (mean = 3.1; n = 115), early childhood teacher (mean = 3.3; n = 370); early childhood assistant (mean = 2.8; n = 305), school-age worker (mean = 2.9; n = 77), and school-age assistant (mean = 2.9; n = 44). Directors were also asked, "Has the length of time to fill a vacancy changed over the last two years?" For each staff category, directors were asked to rate any change using a five-point scale.10 The mean rating directors reported are as follows: 3.8 (n = 82) for administrative directors; 3.8 (n = 120) for director/teachers; 4.0 (n = 339) for early childhood teachers; 3.8 (n = 267) for early childhood assistants; 3.9 (n = 95) for school-age workers; and, 3.7 (n = 73) for school-age assistants. While many directors reported that the time to fill a vacancy has stayed the same over the last two years, for many positions the majority of directors reported that the time to fill a vacancy has actually increased by more than 2 weeks compared to just a couple of years ago. Directors reported on the ease or difficulty of filling vacancies within the past two years on a five-point rating scale. Their responses are reflected in Table 13. 10Scale: 1 = "Decreased by more than 2 weeks"; 2 = "Decreased by 1-2 weeks"; 3 = "Stayed the same"; 4 = "Increased by 1-2 weeks"; 5 = "Increased by more than 2 weeks"
1Scale: 1 = "Very easy"; 2 = "Somewhat easy"; 3 = "Neither easy nor difficult"; 4 = "Somewhat difficult"; 5 = "Very difficult"
Many center directors expressed their concerns with the difficulties they have had finding qualified staff to work in their centers. "Licensing requirements are too strict for part-time employment, especially vaccination requirements. It is hard to locate these records for older applicants and too expensive to get the vaccines." "We cannot offer enough hours as a part-time school to attract people who need more pay." Directors were asked to identify the number of hires within the last year that met, exceeded, or did not meet IDCFS qualifications for their position as defined in the licensing standards. Table 14 indicates that nearly all hires at least met IDCFS standards. Those least likely to do so were school-age workers or school-age assistants. Administrative directors, director/teachers and early childhood teachers appear to be the most likely to exceed standards as opposed to merely meet them. Center directors were asked to compare the qualifications of staff hired within the past two years with the qualifications of staff hired more than two years ago and record their impressions using a five-point scale (see note in Table 15). Table 15 indicates that on average, directors appraised new hires to have similar qualifications as previous hires, which is in keeping with results from the FY 2013 and FY 2015 reports. Prior Salary and Staffing Survey data have revealed most directors to indicate that their new hires were somewhat more qualified. One explanation for this trend over the last three surveys could be that the increase of applicants who meet and exceed IDCFS qualifications over the past several years are now the norm; therefore, it only appears as if the frequency of qualified applicants is stagnant. 1Scale: 1 = "Much less qualified"; 2 = "Somewhat less qualified"; 3 = "Same qualifications"; 4 = "Somewhat more qualified"; 5 = "Much more qualified"
From providing a male role model for children to helping fathers become more involved in their child's care, males serve a myriad of important functions in early care and education. Directors indicated the number of males who applied for advertised positions within the past two years. Table 16 shows the results. As Table 16 shows, the positions of school-age worker and school-age assistants garnered the highest percentage of male applicants. This is consistent with past research which found that a higher percentage of men tend to be employed in afterschool child care than in other child care arenas.11 Overall, the number of male applicants for all positions increased from 3.8 percent in FY 2015 to 6.2 percent as of this report. Directors were further requested to specify the number of males they had hired within the past two years. Results displayed in Table 17 indicate that at least 10 percent of males who applied for each position were hired, with the exception of director/teacher. For positions related to working with school-age children, the percent of male hires out of total male applicants was much higher and over 30 percent. Compared to all applicants for open positions, one percent of applicants hired for the position of administrative director were male and less than one percent of director/teacher, early childhood teacher, and early childhood assistants were male. Overall, less than one percent (0.9 percent) of all new hires were male. The proportion of male hires per open position was generally consistent with the low percentages seen in past reports. The only notable difference was for school-age assistants who went from a proportion of 10.1 percent in 2015 to 4.8 percent in 2017. As expressed previously in this report, the diversity of languages spoken by children in child care centers suggests that centers have staff with which children can effectively communicate in their primary language. Directors were asked to identify primary language information for applicants and hired employees in the past two years, and the results are displayed in Table 18. More than 89 percent of the non-English fluent applicants applied for the position of early childhood teacher or assistant. The proportion of applicants fluent in other languages was slightly lower across all roles than in the FY 2015 report. Less than ten directors reported applicants who were fluent in the following languages: Korean, Vietnamese, Japanese, German, Farsi, French, Hebrew, and Other. Directors were then asked to indicate how many applicants fluent in a non-English language that had been hired as shown in Table 19. The percent of applicants fluent in other languages that were hired decreased from 57.3 percent reported in FY 2015 to 35.0 percent in this report, which is more in line with what had been reported in FY 2013. The overall proportion of applicants fluent in another language hired out of all applicants also decreased from 4.5 percent in FY 2015 to 1.4 percent in this report. Less than ten directors reported hiring individuals who were fluent the following languages: Chinese dialect, Korean, Vietnamese, Japanese, Russian, Farsi, Hebrew, French, Hindi/Urdu, and Other. In order to explore why many are disinclined to go into child care as a career option, directors were asked to rate a list of potential deterrents on a scale of importance from 1 ("Not Important") to 5 ("Very Important"). "Low Salaries" and "Inadequate Benefits" (both with a median of 5.0 and a mean greater than 4.5) were listed as the top two reasons that deterred people from the field of early care and education. Other reasons which yielded a mean or median of 4.0 or higher were: "Better Career Opportunities in Other Child Care Professions," "Child Care Not Seen as Professional Career", and "Child Care Not Respected as Profession." These results are consistent with previous Salary and Staffing Survey reports. "[My concern includes] the increasing demands for training and higher expectations for work performance without any increased pay. Increases in pay can't occur without adequate enrollment and increased revenue. The current financial climate doesn't support raising parent tuition since subsidized parents are already struggling with paying higher co-pays, subsidized rates have stayed stagnant, and private pay parents can't afford higher rates." "Qualifications for positions are increasing without seeing results in salaries. How can you ask people to invest in a [higher degree] and not pay them better?" Center turnover was measured by drawing data from the statewide provider database on two separate occasions. The number of practitioners actively providing care on June 30, 2015 (June 30 represents the end of a fiscal year) was compared to the number in that same category on June 30, 2017. Table 21 displays the number of providers who are currently providing care, the number of new providers who were added to the database during 2017 and the number of providers who were active in the provider database as of June 30, 2017. As Table 21 shows, there was a slight decrease in the number of center providers for the two-year period, but a slight increase of total licensed capacity. In surveys prior to FY 2015, in order to assess staff demographics and understand the effects of the economy on the child care industry, directors were supplied with a supplemental worksheet12 and asked to complete it for all staff members who were employed either full- or part-time in an IDCFS defined position (director and classroom personnel). These data were the best available information at the time. The launch of the Gateways to Opportunity Registry in July 2009 provided Illinois with a workforce data system that could answer many of these same questions. In September 2012, IDCFS mandated that all licensed child care center and family child care home staff/providers join and maintain current membership in the Gateways Registry. This policy helped to ensure that nearly the entire licensed child care workforce is in the data system. For that reason, the FY 2015 report was the first where the supplemental worksheet was discontinued and administrative data from the Gateways Registry were used to provide results about staff demographics, education, and wages. This FY 2017 report continues with that same methodology. According to the Gateways Registry, there are 49,281 individuals working in licensed child care centers in Illinois and 42,755 in IDCFS defined positions. 12The staff worksheet requested detailed information about each employee: position, age, primary language, education, certification, age group worked with, hourly wage, hours worked per week, start date, and benefits. For the purposes of this survey full-time employment was defined as 40 hours per week.13 (Neither the Illinois Department of Labor nor the federal Fair Labor Standards Act14 distinguishes between part-time and full-time employees.) When completing the Gateways Registry membership form, individuals were asked to indicate the number of hours worked per week. Results indicate that overall, 59.6 percent of listed employees were defined as full-time and 40.4 percent as part-time. 13The work week was defined as 40 hours because the survey delineates a full-day as 8 hours/day. Table should be read: "82.7 percent of administrative directors were full-time whereas 17.3 percent were part time." Individuals report their educational achievements in the Gateways Registry and can update their record as they gain more education. In addition, they can also report credentials and certifications they have earned, such as the Professional Educator License (PEL) with an early childhood endorsement.15 The educational requirements necessary to be director or teacher-qualified (see Appendix C) are stipulated in the IDCFS licensing standards for day care centers. In summary, directors can qualify through 60 semester hours of coursework from an accredited college or university [18 semester hours must be directly related to child care (ECE) or child development (CD)], or can qualify through a combination of education and work experience. Similarly, early childhood teachers can either complete 60 hours of coursework from an accredited college or university (six semester hours must be directly related to ECE or CD) or qualify through a combination of education and work experience. Directors of school-age programs and school-age workers are required to have coursework directly related to school-age child care, child development, elementary education, physical education, recreation, camping, or other related fields. Table 24 shows that over 90 percent of all directors attained some level of college education. A large percent (63.5 percent) had earned their bachelor or master's degree, which are educational milestones that exceed IDCFS licensing standards. Nearly 83 percent of early childhood teachers attained some level of college education; moreover, 25.4 percent had achieved an associate degree and 37.2 percent a bachelor's degree or higher (which also exceeds licensing standards for that position). Of early childhood teachers with a bachelor's degree or higher, 9.5 percent reported having a Professional Educator License (PEL) with an early childhood endorsement. More than one quarter of early childhood teachers (27.5 percent) had earned a degree in early childhood education or child development (ECE/CD)16. Close to half (40.6 percent) of early childhood assistants and 25.9 percent of school-age assistants had received education beyond a high school or GED degree. There are also a number of Gateways to Opportunity Credentials that may be earned by individuals working in the field of ECE, as shown in Table 25. These credentials recognize the education, experience, and professional contributions of early childhood practitioners. Gateways Credentials are also a key component of ExceleRate Illinois, the state's Quality Recognition and Improvement System (QRIS). The ExceleRate Circles of Quality, above the Licensed Circle, require that a percentage of personnel have achieved a Gateways Credential. 15Known previously as a Type 04 (early childhood) teaching certificate, the PEL with an early childhood endorsement is granted by the Illinois State Board of Education to educators who have earned a BA degree in early childhood and passed all state exams and requirements to teach in a publicly funded program serving children birth through age eight. 16This figure is likely under-reported as records that did not have a major listed were coded as "other" for purposes of this analysis. Table should be read, "Out of 3,734 administrative directors for whom education and credential information is available, 13.4 percent had a Master's degree in a field other than early childhood education or child development." 3ECE is the acronym for early childhood education; CD is the acronym for child development. Note: Gateways Credentials may be earned by individuals in other settings (e.g., family child care) or by those no longer working in direct care. The "N" for this table represents only Gateways Credentials attained by individuals in these specified positions within licensed centers. In salary and staffing surveys prior to FY 2015, directors were asked to record the number of years of paid experience each staff member had in the field of early care and education. With the change to using administrative data from the Gateways Registry for staff-related data in FY 2015 and present reports, a corresponding data field is not available. The Gateways Registry does collect information on how long individuals have been employed in their current place of employment, based on capturing their start date of employment. Table 26 shows that among all child care practitioners, the average years employed by their current employer was 5.0 years (median = 2.5 years). Administrative directors have been employed in the same program for longer than early childhood teachers and school-age workers, who in turn have been employed longer than early childhood and school-age assistants. 5.8 percent (n = 35) of 600 respondents reported a salary scale differentiated on some other basis. Other salary scales were based on length of employment/years of service, union contracts, pay grades set by campus/college human resources, job title/position description, minimum wage, responsibility, performance, and seniority. As part of the Gateways Registry, individuals have the option to report their hourly wages and/or annual salary with their employment data. The average hourly wage for all employees (n = 27,975 employees) was $12.75 (median = $12.00) (f = 1610.92, p (less than) .001). Table 27 depicts hourly wages by position. Reports prior to FY 2015 also collected wage data, but it was provided by the director completing the survey on behalf of their staff. Caution should be exercised if comparing data from reports before FY 2015 to the FY 2015 and current report for this reason. 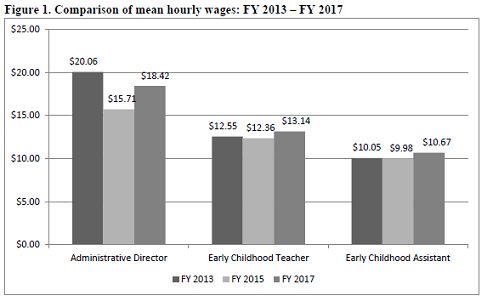 In Figure 1, the mean hourly wages for the positions of director/teacher, early childhood teacher, and early childhood assistant are compared over time. These figures have not been adjusted for inflation. The average hourly wage for early childhood teachers and assistants saw a small increase compared to the wages in FY 2013. The average hourly wages for administrative directors have fluctuated more noticeably.18 Still, as far as the consumer price index goes, administrative directors would need to earn $21.15 per hour, early childhood teachers $13.23 per hour, and early childhood assistants $10.44 per hour in 2017 to have the same buying power as $20.06, $12.55, and $10.60 had back in 2013.19 Overall, child care center staff wage increases are generally not keeping up with inflation. The salary data from the Gateways Registry can be compared to the most current Occupational Employment Statistics (OES), compiled by the Bureau of Labor Statistics (BLS).20 Although the data may not be strictly comparable, the national figures provide some context for interpreting the hourly wage of child care personnel in Illinois. Three categories are primarily used by the BLS to include various child care positions. The categories are listed below, along with the descriptions provided on the BLS website. The mean and median hourly wages specified by the BSL are also included, followed in parenthesis by the mean and median hourly wages from Table 27. Category 1 (11-9031): Education Administrators, Preschool and Child Care Center/Program. Description of position: "Plan, direct, or coordinate the academic and non-academic activities of preschool and child care centers or programs." As of May 2017 the mean hourly wage for this position was $31.66 and the median was $24.02 (mean = $18.42; median = $16.42). Category 2 (25-2011): Preschool Teachers, Except Special Education. Description of position: "Instruct preschool-aged children in activities designated to promote social, physical, and intellectual growth needed for primary school in preschool, day care center, or other child development facility." As of May 2017 the mean hourly wage for a preschool teacher was $15.27 and the median was $13.64 (mean = $13.14; median = $12.50). Depending on the responsibilities of an assistant teacher, the position could fall under either the BLS category of Teacher Assistants or Child Care Workers. Category 4 (39-9011): Child Care Workers. Description of position: "Attend to children at schools, businesses, private households, and child care institutions. Perform a variety of tasks, such as dressing, feeding, bathing, and overseeing play." As of May 2017 the mean hourly wage for a child care worker was $11.40 and the median was $10.77 (mean = $10.67; median = $10.00). 18The decrease in hourly wage compared to 2013 may be attributed to the fact that the 2015 and analysis is based on administrative data from the Gateways Registry, which is a considerably larger population than what was represented by previous surveys. In addition, the 2015 report had those in the role of "director/teacher" grouped in with administrative directors, which may have artificially lowered the wages. 21The annual mean wage listed in BLS was used to derive the hourly mean wage for Teacher Assistants. Comparison of median hourly wages are not available. Summing across all staff positions with wage data available (n = 27,752 employees), hourly wages are higher for full-time compared to part-time employees. Full-time employees averaged $13.21 per hour compared to $12.12 per hour for part-time staff. The median hourly wage for full-time staff was $12.03 and part-time staff was $11.00 per hour (f = 384.85, p (less than) .001). Table 28 shows the breakdown of hourly wages by position and employment status. The findings across all positions, with the exception of early childhood teachers, show that staff make more per hour when employed on a full-time versus part-time basis. Table 29 (n = 27,922; f = 9.05, p (less than) .001) reveals that higher wages accompany increased years of employment with the same employer. Table 30 shows wages typically increase as level of education increases. Note: Statistics for which there were fewer than three observations were deleted. 22The only exception to this was for early childhood assistants with a master's degree or higher. While those with a master's in ECE/CD did earn more than those with a master's in another field, the difference was not statistically significant. Using administrative data on program quality from the Data Tracking Program (DTP), variables were created to indicate the national accreditation and ExceleRate Illinois rating status of licensed child care center programs with staff in the Gateways Registry. These variables were examined in combination with wage data to determine whether there were any significant differences in wages between participating and non-participating programs. Accredited centers could hold accreditation from one of several early care and education associations: the National Association for the Education of Young Children Accreditation, the National Early Childhood Program Accreditation, the National Association of Child Care Professionals, and the Council of Accreditation for School-Age Care. A center was considered accredited if they had one or more of the former accreditations. Table 31 demonstrates that, overall, without regard to position, there was a significant difference in the wages paid by accredited versus non-accredited centers. Accredited centers paid staff significantly more (mean = $13.68; median = $12.50) than non-accredited centers (mean = $12.52; median = $11.50) (f = 282.50, p (less than) .001). The ExceleRate Illinois QRIS recognizes program quality achievements of child care providers. The system has Circles of Quality which providers can achieve by meeting required criteria for each circle. Licensed child care centers who have earned the Gold Circle of Quality have reached the highest level of ExceleRate.23 Hourly wage and position of employees in the Gateways Registry were compared to the level of ExceleRate participation the employee's center had reached. The comparisons can be seen in Table 32. As shown in Table 32, there was an overall significant difference in the wages paid by ExceleRate participating versus non-ExceleRate participating licensed child care centers (f = 165.14, p (less than) .001), with wages being highest in programs with a Gold Circle of Quality. Not-for-profit programs paid a significantly higher hourly wage than for-profit programs. Not-for-profit staff averaged $13.18 (median = $11.78) per hour as compared to for-profit staff who averaged $11.87 per hour (mean = $11.00) (f = 155.30, p (less than) .001). Table 33 depicts hourly wage by position and legal status (for profit vs. non-profit). One of the primary functions of the survey is to calculate the mean and median hourly wage by region. CCR&R Service Delivery Areas (SDAs) are used here to define the word "region". The mean and median hourly wages earned by all IDCFS defined positions by SDA are presented in Table 34. "Salary and benefits is most frequently the reason for permanent teaching staff to leave our employment. McDonald's has a higher starting pay for part-time work than our part-time teacher starting wages." "Over 65% of our enrollment is CCAP children. Unless and until the CCAP rates increase, we cannot increase our hourly wage for our teachers." "It is becoming increasingly difficult to retain quality staff." Directors where asked about the types of benefits available to their employees. This FY 2017 survey included an expanded list of benefits to get a more complete picture of what is offered in licensed center-based settings. In addition, the question was asked regarding benefits offered to full-time staff vs. part-time staff. Due to an error in the survey administration, only responses to the full-time staff questions were captured. As Table 35 shows, over 90 percent of responding centers offered paid holidays and vacation to its full-time employees. Additionally, three-fourths offered paid sick days. In terms of wage increases, two-thirds of centers offered periodic increases in wages based on performance and educational attainment, while less than half offered yearly cost-of-living increases. About three-quarters offered free or reduced fee child care to their employees and close to 80 percent offered payment or reimbursement for educational or training expenses.24 While half of the responding centers off health insurance, less than half offer dental insurance, life insurance, or retirement plans/pensions. 24Professionalizing the early childhood field and workforce is supported by various state initiatives. Center-paid educational stipends help staff meet their IDCFS requirement of 15 training hours per calendar year as well as assist centers to meet qualifications for an ExceleRate Circle of Quality. Some educational opportunities can be reimbursed through Professional Development and Improvement Funds. Money is also available through the Gateways to Opportunity Scholarship Program to help child care practitioners meet their educational goals. "Child care professionals are subsidizing the cost of child care by working for low wages and without benefits." "The difficulty that many day cares face is that because of the high cost of qualified teachers, we cannot offer many of the benefits that we wish and staff deserve to have." A total of 8,092 IDCFS licensed family child care and group providers were invited to complete the FY 2017 Salary and Staffing Survey. A total of 987 surveys (for a response rate of 12.2 percent) were completed: 903 surveys were completed online; 84 were completed in the form of a paper document. Table 36 presents the response rates by CCR&R service delivery area (SDA) (see Appendix B). There may be a discrepancy in the number of responses for each question because not all respondents answered every question. An "n" will be used to signify the number of responses to an item. Nearly all of the family child care practitioners who completed this item on the survey were female (99.3 percent; 845 of 851 respondents). Family child care practitioners were asked to identify their age. As seen in Table 37, the preponderance of respondents were 30 years or older. The most frequently reported range of age was 50-59 years. The least frequently reported range of age was "under 20 years" (IDCFS requires all "caregivers" in a day care home to be 18 or older) and was closely followed by the age range of 20-29 years of age. The category "60 years or over" accounted for 24.2 percent of all respondents. *The question asked was "How old are you?" 25According to 2017 data from the Census Bureau https://www.census.gov/quickfacts/fact/table/IL,US/PST045217, 14.7 percent of the state population self-identified race/ethnicity as African American and 17.0 percent of the state population self-identified race/ethnicity as Hispanic or Latino. Respondents were also asked to identify their primary language. The majority of respondents (86.3 percent; n = 735) indicated that their primary language was English. As to the extent of other primary languages reported for the 13.7 percent of providers who spoke a language other than English, the primary language spoken was Spanish. Out of the 852 reporting providers, 12.1 percent (n = 103) indicated their primary language was Spanish, and 1.4 percent (n = 12) indicated their primary language was another language. The additional languages providers listed included Bulgarian, French, Hindu/Urdu, Hungarian, Italian, Polish, Punjabi, and Yoruba. As a way of capturing longevity in family child care, practitioners were asked the length of time they had been paid to provide child care in their homes. The average length of time reported by providers was 16.2 years (n = 843; median = 15.0 years; range = 1 to 45 years). There is often movement within the field of child care; therefore, practitioners were asked whether they were previously employed in other child care and education settings (i.e., child care center or public school). Out of the 850 responding practitioners, 30.0 percent (n = 255) had worked in another child care and education setting for an average of 7.7 years (median = 5.0 years; range = 1 to 40 years). *ECE is the acronym for Early Childhood Education; CD is the acronym for Child Development. 26Known previously as a Type 04 (early childhood) teaching certificate, the PEL with an early childhood endorsement is granted by the Illinois State Board of Education to educators who have earned a BA degree in early childhood and passed all state exams and requirements to teach in a publicly funded program serving children birth through age eight. Utilizing information from NACCRRAware and the Data Tracking Program (DTP), variables were created to indicate the accreditation and ExceleRate Illinois status of family child care home providers who participated in the Salary and Staffing Survey. In FY 2017, 5.4 percent (n = 53) of family child care providers responding to the Salary and Staffing Survey were accredited through the National Association for Family Child Care Providers (NAFCC),27 the primary national accrediting body for family child care homes. According to the survey sample, participation in ExceleRate at a level higher than the Licensed Circle of Quality was significantly associated with achievement of NAFCC Accreditation (p (less than) .001, Fisher's exact test) such that 8.1 percent of non-accredited providers were also participating in ExceleRate whereas 71.7 percent of NAFCC accredited providers were participating in ExceleRate. 27Per the online search tool at http://www.nafcc.org, there are 1,338 NAFCC Accredited providers and 183 (13.7 percent) are from Illinois. Providers were asked to report upon the demographics of the children and families they serve. They were asked to estimate the number of children from each ethnic group and the number of second language learners in their care. Table 40 presents the mean proportions of children from each ethnic group reported by respondents. Practitioners were asked to report whether or not they had English language learners (ELL) enrolled in their programs. Of 987 respondents to this question, 18.4 percent (n = 179) indicated they had second language learners enrolled in their programs. Of those with ELLs, 84.4 percent (n= 151) reported having children whose primary language was Spanish as ELLs in their programs. Many other languages were represented in the sample, each with less than ten providers serving children who are ELLs of a particular language such as: Arabic, Chinese dialects, French, German, Greek, Hebrew, Hindi/Urdu, Japanese, Korean, Lithuanian, Polish, Russian, Serbian, Ukrainian, and Yoruba. Providers (n = 863) were asked about their awareness of professional development opportunities and programs available in Illinois. Nearly all (99.2 percent; n = 856) knew of the Gateways to Opportunity Registry. More than three quarters (76.5 percent; n = 660) knew of the Great START Program. Approximately the same (77.4 percent; n = 668) had heard of the Gateways to Opportunity Scholarship Program. Over 80 percent (81.2 percent; n = 701) knew of Gateways to Opportunity Credentials. Close to half (45.7 percent; n = 394) knew of the Professional Development Advisor Program. About 80 percent (80.1 percent; n = 691) knew of ExceleRate Illinois. Almost two-thirds of participants (60.6 percent; n = 523) had heard of the consultant/specialist (e.g. Mental Health Consultant, Quality Specialist, Infant/Toddler Specialist) services offered by the CCR&Rs. Nearly three quarters (70.0 percent; n = 604) knew of the online training opportunities available through the Gateways i-learning System. 23.9 percent of family child care homes (n = 236 of 987) had at least one Great START recipient in the past two years. Those 236 programs had a total of 248 recipients. 4.3 percent (n = 42 of 987) of family child care programs had at least one Gateways to Opportunity Scholarship participant for a total of 45 participants. Licensing standards require family child care practitioners to have a minimum of fifteen training hours per year. Generally, respondents exceeded this minimum. Family child care providers reported devoting 23.0 hours to workshops or conference training in the last year (n = 908; median = 17.0 hours; range = 1-300 hours). The content of training can vary in its relevance to early care and education (ECE). Family child care providers were asked where they received their training within the past year. Table 41 reports the results. In this survey, online training was the principal source of training for family child care practitioners, with nearly three quarters (74.9 percent) reporting using online training as a source to meet their training needs. This is a significant increase from the 55 percent in FY 2015 and 35.1 percent in FY 2013 that reported taking online training. Previous reports showed that Child Care Resource and Referral workshops were the primary source of training; however, this has been on the decline from 81.7 percent in FY 2013 to 66.3 percent in FY 2015 to 62.3 percent in this report. The increased availability and usage of online training opportunities reported is a likely factor for this decline. Percentages add up to greater than 100 percent as respondents were asked to endorse all applicable items. Also, the sum of individual responses to each option will add to greater than the overall "n" respondents to the question. Nearly 90 percent (88.1 percent) of all respondents expressed that they thought there were adequate training opportunities offered; however, that does not mean that all providers are able to attend those training opportunities. In order to determine what might hinder an individual's ability to attend trainings, providers were presented with a list of potential barriers to attending trainings and were asked to select all that applied. 5.0 percent (n = 36) selected the item "Quality of training is not good." Additionally, 17.1 percent (n = 122) selected the "Other" option and specified the following items as barriers to attending trainings. Of the 122 providers that selected "Other", 72.1 percent indicated that the availability of trainings (location, timing of trainings, topic offerings, language barriers, and enrollment capacity) was problematic. The remaining providers indicated that the trainings were too far away (14.8 percent), they were interested in higher-level trainings than what were available (9.8 percent), or had (3.3 percent) personal circumstances that were preventing them from attending training. Professional development is also available by taking coursework in early care and education at higher education institutions. Practitioners were posed the question, "Have you completed any ECE or CD coursework within the past two years?" Of the 954 practitioners who responded to this survey question, 107 (11.2 percent) reported "yes" and reported an average of 29.6 semester hours (median = 16.0) completed in the last two years. During a typical week, providers cared for an average of 7.8 (n = 965; median = 8.0) children (excluding their own). Just over 89 percent of providers indicated that they accept children whose families receive IDHS or IDCFS financial assistance. Providers also responded that they have an average of 5.5 (n = 588; median = 4.0) children in their program whose child care is being funded through the Child Care Assistance Program (CCAP) or IDCFS vouchers.29 Providers reported serving an average of 4.6 of all client families (n = 476; median = 3.0) who receive financial assistance (from government, employers, local agencies) to subsidize child care costs. "It is difficult to have a set budget when my enrollment is always changing. It's also hard with staffing because the hours and pay have to constantly change due to [changes in] enrollment." 28Licensed capacity in NACCRRAware adds regular capacity and extended capacity together. Extended capacity signifies the number of before- and after-school children a provider may care for on top of their regular capacity. For any capacity typically over 8, an assistant is required to be present. 29About 6.7 percent of providers indicated that they have had children/families on CCAP enrolled over the last 2 years, but did not have any children on CCAP currently. Those providers were excluded from this analysis. 30Data from the Data Tracking Program (DTP) was used to obtain the ExceleRateTM Illinois status of all providers who participated in the Staffing and Salary Survey. IDCFS licensing requirement for staff in group homes and child care homes differ. Staff employed in group homes must have a high school diploma or equivalent and be at least 18 years of age if an on-site supervisor is present. If not, staff must be 21.31,32 Staff working in day care homes are required to be at least 14 years of age, work under the direct supervision of the family child care provider and be at least five years older than any child for which they provide care.33 In the 2017 Salary and Staffing Survey group family child care practitioners and family child care practitioners reported on the assistants they employed. Of the 954 providers that responded to the question, 32.7 percent (n = 312) indicated hiring paid assistants. Additionally, out of 874 respondents, 27.1 percent (n = 237) reported using unpaid assistants. Paid family child care assistants received an average of $10.17 per hour (n = 265; median = $10.00). Their typical work week averaged 25.9 hours (n = 296; median = 25.0). Family child care practitioners were then asked to provide additional thoughts about staffing in the comments section of the survey. The primary theme was about being able to afford to have an assistant and to pay them a competitive wage. Below are some representative comments. "I would love to have a paid assistant, however I can't afford it with only 7 children enrolled." "My main staff member is a college student so as soon as her degree is done, the $11 an hour I pay will not be sufficient and she will likely go elsewhere." 36Based on this rationale, all reported wages under $7.75 were excluded from this analysis. Respondents (n = 794) indicated that they get paid to work an average of 50.7 hours per week (median = 52.0 hours) taking care of children, and their child care home operates an average of 49.4 weeks per year (n = 833; median = 51.0 weeks). In addition to hours spent directly with children, providers reported spending an average of 16.0 hours per week (n = 809; median = 12.0 hours) on various activities performed before or after business hours. These activities include preparing food, shopping, cleaning, record keeping, and preparing educational activities for the children. Practitioners were also asked whether they ever closed for holidays, vacation, sick days, training, or any other occasion. Out of 852 providers who responded, 95.3 percent (n = 812) responded affirmatively; a major increase from the previous two surveys. (This increase was likely due to a change in survey administration and that this question was not required. Thus, people who were not closed for any of these reasons may have simply skipped the question.) The average number of days closed per year was 15.3 days (median = 14.0 days, n = 812). Practitioners were queried about their annual expenses for food, utilities, insurance, and materials; all expenses except wages. Average annual expenses totaled $15,354 (median = $12,000) for the 620 providers who responded to this question. Expenses in 2017 were similar to those reported in the past two surveys. 75 percent of family child care providers netted less than $22,000. In FY 2017, the average hourly wage family child care providers earned was $7.48 (compared to the state minimum wage of $8.25 per hour);37 however, this hourly wage only reflects the average length of time that direct service is provided to children. When the average hours spent cleaning, preparing food, shopping, recordkeeping, and preparing educational activities for children (16.0 hours) are factored into the equation, child care providers work on average 65.00 hours per week and average $5.67 per hour. As independent business owners, family child care providers set their own rates. Rates can exceed the CCAP rates reimbursed by the state. Providers can choose to have parents pay the difference between the CCAP reimbursement rates and their private rates. In FY 2017, providers were asked to provide information about their experience with the IDHS subsidy program. These questions specifically addressed whether providers charged parents more than their CCAP copays, the difficulty they experience in collecting copays, and whether or not the difficulty in collecting copays had changed in the past two years. Out of 835 respondents, 17.5 percent of providers (n = 146) reported charging families more than their CCAP copay; 82.5 percent (n = 689) of providers reported charging families their CCAP copay only. Out of 740 practitioners who rated the difficulty of collecting copays, 43.8 percent reported that collecting copays was "very easy or somewhat easy," 19.9 percent responded that it was "neither easy nor difficult", and 36.3 percent responded that collecting copays was "somewhat difficult or very difficult." In response to whether the difficulty in collecting copays had changed in the past two years, out of 734 respondents, 16.2 percent responded that collecting copays had become "much easier or somewhat easier", 60.8 percent responded the difficulty in collecting copays had "stayed about the same", and 23.1 percent responded that collecting copays had become "somewhat or much more difficult." Providers were then asked to rate how their financial situation had changed in the past two years. In response to changes in their gross annual earnings, out of 987 providers responding to the question, 13.3 percent said their gross income had decreased greatly, 21.0 percent said their gross income had decreased somewhat, 41.7 percent stated their gross income remained about the same, 20.9 percent said their gross income had increased somewhat, and 3.1 percent responded that their gross income had increased greatly. In response to changes about their net annual earnings, out of 823 providers, 17.9 percent said their net income had decreased greatly, 29.2 percent responded that their net income had decreased somewhat, 37.8 percent stated their net income had remained about the same, 13.6 percent responded that their net income had increased somewhat, and 1.6 percent responded that their net income had increased greatly. When asked about changes in their annual expenses, out of 829 providers, 8.7 percent responded that their annual expenses had increased greatly, 36.4 percent stated their annual expenses had increased somewhat, 33.2 percent said their annual expenses remained about the same, 15.0 percent stated their annual expenses decreased somewhat, and 6.8 percent stated their annual expensed had decreased greatly. 37The average hourly wage of a family child care practitioner can be calculated using the formula: Average net income ÷ (average of hours worked per week X average number of weeks worked per year). Providers were asked to report on other sources of income beyond their family child care programs. Just under one tenth of providers (9.7 percent) reported having a second paid job. Nearly 60 percent of providers (59.6 percent) indicated there was at least one other adult who contributed to their household income. In addition, the Child and Adult Food Care Program38 was an income source identified the majority of providers (82.2 percent). 38The Child and Adult Care Food Program is a nutritional program funded through the USDA. In Illinois, this reimbursement program is administered by the Illinois State Board of Education. The program educates providers about proper nutrition and reimburses them for the meals and snacks they serve to children in care. "Working in this field for as long as I have should afford me some benefits like vacation, training days, and sick days. I lose a lot of money waiting for approvals that never come, or because families do not qualify for the CCAP program. I have not taken a salary for myself in a few years." "The amount the state pays should be comparable to private pay rates." Percentages add up to greater than 100 percent as respondents were asked to endorse all items applicable to their programs. Also, the sum of individual responses to each option will add to greater than the overall "n" respondents to the question. IDCFS requires family child care homes to have a written policy that describes what will occur if a child is picked-up late. This policy also includes information about any late fees that will accrue. Out of 853 practitioners who responded to this question, 56.0 percent charged a late fee (or early drop-off fee). The fee for late pick up or early drop off averaged $2.14 (median = $1.00) per minute for family child care providers who stated their fee (n = 453). Practitioners were asked whether they were currently covered by any health insurance or medical plan. In response, 94.5 percent (n = 812) of the 859 child care practitioners that responded reported having health care coverage. As with 2015, this represents a significant increase over the 80.4 percent reported in 2013 and is likely due to requirements of the Affordable Care Act. Further analysis of health care coverage shows that 14.3 percent received full coverage and 22.9 percent received partial coverage through their spouse's employer, 24.4 percent purchased health insurance on their own, and 20.4 percent reported that they were Medicaid/Medicare eligible. Of respondents, 16.6 percent had paid health care coverage received through a variety of other sources, including as retirement benefits from previous employers, community health services, and through SEIU (union for family child care providers). There were 1.4 percent of respondents who indicated they have health care coverage but that did not respond to one of the options displayed. Nearly 60 percent of practitioners (59.4 percent) indicated that they contribute to Social Security and Medicare. When asked the question, "In the last year, have you set aside any savings for your retirement," just over one quarter of the respondents (29.4 percent) said they had (slightly up from 27.8 percent in the 2015 report). Per the comment section of the survey, many practitioners expressed anxiety about the lack of affordable health care insurance (including dental and vision care) available to child care providers and their families. In addition, many acknowledged the need for retirement benefits. One provider's remarks are shown below. "As a small business owner, I cannot afford to offer any benefits. My staff needs to purchase their own insurance and 401k plans. With minimum wage increases, as well as staying competitive with area centers, $14.50/hr. is the minimum amount I can offer. This leaves me no profits on a monthly basis." Family child care practitioners often work alone and have no other adults within close proximity. Research suggests that the lack of "social, instrumental, and problem-solving support over a long workday as the only adult in the setting" and the lack of support when "having to play multiple roles" are potential sources of stress for providers. One way to combat that stress is to use support services such as participation in a professional organization or network with other professionals.39 Based on this rationale, providers were asked whether they had any contact with any other child care professionals. A predominance of home-based practitioners (83.6 percent) responding to the survey indicated that they have at least one other child care professional with whom they can discuss a problem in their program. There are national, state, regional and local child care associations that support the needs of family child care providers. Nearly half of respondents (48.6 percent; n = 413 of 850) reported that they were members of a child care association. Two-thirds (64.2 percent; n = 551 of 858) indicated that they utilized their Child Care Resource and Referral (CCR&R) as a professional support in the past two years. Local CCR&Rs provide various services to child care professionals. Practitioners were asked to identify the length of time they would continue to operate their day care home. Nearly two-thirds (65.0 percent; n = 558) of providers responded "I don't know"; this is similar to what was reported in FY 2015, but is an increase from the 50.0 percent reported in the FY 2013 survey report. The remainder of providers (n = 300) indicated they would continue to provide child care in their homes for an average of eight years (mean = 8.4 years; median = 6.0 years). This is a slight decrease from the previous survey, which reported a mean of 8.9 years and median of 7.5 years. To gauge potential turnover, providers were asked the question, "In the past two years, have you ever considered no longer providing care?" Just over 40 percent (40.3 percent; n = 346 of 859) had considered closing their business. Respondents who answered "yes" to that question were asked to further clarify by responding to a follow-up question which contained a list of reasons that traditionally contribute to provider burn-out. Practitioners were asked to rate the importance of each item on a scale of 1 ("Not important") to 5 ("Very important"). Table 43 presents the reasons why a provider may discontinue care and various statistics for each reason. Percentage Rating Item as "Very Important"
"I strongly believe that those caring for children in or out of the home should be compensated based on education and experience. As a business owner, I understand that I have the ability to charge what I want, however, if I want to provide quality care to as many children as possible, I have to keep my rates low and competitive." Practitioners were asked to rate on a scale of 1 ("Not important") to 5 ("Very important") a number of items that might influence them to continue providing child care in their homes. Participants rated higher pay and better benefits as the main factors that would most entice them to continue providing child care. "More time off" was also rated as "very important" to nearly half of all respondents (mean = 3.7). (Again, family child care homes are only closed an average of 15.3 days per year.) Table 44 displays the results. 40"Occupation Employment Statistics: May 2017 State Occupational Employment and Wage Estimates for Illinois", Bureau of Labor Statistics, http://www.bls.gov/oes/current/oes_il.htm#00-0000. In order to assess turnover rate, the total number of family child care providers listed in the provider database on June 30, 2015 (the end of IDHS's fiscal year) was compared to the number of providers listed in the same database on June 30, 2017. Through comparison of both databases, data could be collected regarding the number of providers who were new on the database and the number of providers no longer providing child care. Table 45 presents the information. In order to grasp what motivates family child care practitioners to provide child care in their home and capture their perceptions about their work, they were given a series of statements and asked to rate each statement on a scale of 1 ("Strongly disagree") to 5 ("Strongly agree"). Some of the statements focused on motivation and others on perception. As Table 46 reveals, practitioners reported several factors that motivated them to be in the child care business. The most enthusiastically endorsed (rated as "Strongly agree" by 60 percent or more of the respondents) were: "Enjoy teaching children" and "Like to be in business for self." The least common motivator was "Stay at home with own children" (which still received a rating of "Strongly agree" by over almost a quarter of the respondents). Percentage Rating Item as "Strongly agree"
Table 47 reflects the responses to questions that pertain to a practitioner's perceptions about their work. The mean and median, number of respondents, and the percentage of respondents who rated the statement as a 5 ("Strongly agree") are presented in the table below. Perceptions most highly embraced by providers revolved around their sense of professionalism in the job. Most respondents considered themselves to be early childhood professionals, small business owners, and their own boss. They also recognized the role that training plays in furthering and maintaining their status as a professional. Providers were asked to respond to the question, "In the past two years, have opportunities for family child care providers become better, stayed the same, or become worse." Out of 832 respondents, over half (52.0 percent) replied that opportunities over the past two years had "stayed the same", 19.6 percent indicated they had become better, and 28.4 percent responded that opportunities had become worse. "Due to a lack of a budget most providers are struggling to make ends meet. While the salary for child care providers stays the same, the cost of living is steadily increasing." "Getting paid has been difficult, enrollment is lower and working is more stressful…Families have left because they cannot afford out-of-pocket child care expenses." "There are so many regulations and requirements that it seems actually caring for and interacting with the children is falling behind." Practitioners who felt that opportunities for family child care providers had gotten better focused solely on support, resources, and training opportunities. "[My CCR&R] is great! Trainings are wonderful, they help me to feel like a professional and encourage me to strive to be as professional as I can." "Online training has been very helpful!" "We have a Silver Circle of Quality [through ExceleRate] and I know preparing for it has improved every single aspect of my program. I am now watching other programs around me do the same. The chance to excel is leading to providers pursuing excellence in a real way." Providers offered a plethora of other comments which reflected the issues they were facing in their child care programs. Some focused on the practitioner's perceptions and feelings towards the parents in their programs. Others commented about how the public continues to perceive the profession as "babysitting". There were concerns raised about the rules and regulations that must be in compliance with in order to maintain a day care home license (conversely, some providers stated the rules were not strict enough and were not adequately enforced). Some of the practitioners voiced concern over unlicensed or "illegal" day care homes that exist and its impact on their business. Many practitioners shared the various financial difficulties they experienced due to late payments from the state and/or from parents. "It has become harder to get paid for [taking care of] children who receive payment assistance from DHS [subsidy]." "Some families do not pay on time or at all." Despite the frustrations family child care providers may face, there were many comments describing their passion and love for early care and education and the children for which they care. "I have a passion and love for working with children. I enjoy what I'm doing and have gotten a bachelor's degree in early childhood development...my dream is to open a state of the art child care center specializing in children with special needs." "I really love what I do. It is very rewarding to see the children develop and grow. I don't like the fact that if I receive a call from a family who needs care for their infant, I have to turn them away because of my enrollment and not being able to afford to hire an assistant. I am at capacity with the number of children I can care for in that age range." Child care is a vital foundational service that allows for employment and economic betterment for families. Without affordable quality care options, parents are less likely to function effectively in their jobs and children are less likely to receive the developmentally stimulating environments proven to benefit them. Research has shown high quality child care contributes to young children's social competence and cognitive development.41 A nurturing and stable relationship with a provider is one important component of high quality care settings. According to the National Association for the Education of Young Children, the education and stability of the child care workforce are critical to the well-being of children and their working parents. Young children have much to gain from a well-educated and stable child care workforce; however, Child Care Aware of America asserts that the minimal requirements for education (many states do not require any education beyond high school) and the high turnover rate among child care practitioners (roughly one-third leave the field each year42) is challenging the opportunity for quality child care to be achieved and maintained. In knowing the importance of education and continuity in the care of children, it is important to learn more about the child care workforce within the state of Illinois as a means of ensuring quality care for all children. As such, the Illinois Salary and Staffing Survey provides in-depth information every two years about wages, salaries and benefits, and other information pertinent to the child care work environment in licensed child care centers and in licensed family child care homes, as reported through the eyes of the child care providers. To complement the Illinois Salary and Staffing Survey, the Gateways to Opportunity Registry can provide more frequently collected and updated information regarding several workforce characteristics, including qualifications and salaries. The majority of the child care workforce in Illinois has attained formal education beyond high school. Over 90 percent of center directors, 83 percent of early childhood teachers, and 43 percent of family child care providers had some college education. More than 60 percent of center directors had earned their bachelor's or master's degree. In addition, 71.1 percent of early childhood teachers and 36.7 percent of family child care practitioners had earned an associate, bachelor's, or master's degree. Further, 27.5 percent of early childhood teachers earned their degree in early childhood education (ECE) or child development (CD), and 12.8 percent of family child care providers earned their degree in ECE/CD. As is the case at the national level, job turnover among child care providers in Illinois is a continuing problem. While the overall percentage of centers experiencing turnover in the past two years decreased with regard to administrative director and director/teacher positions, there were slight increases for early childhood teacher and assistant positions. At an individual staff level, the past two years showed a turnover rate of 33.6 percent for early childhood teachers and a 39.1 percent turnover rate for early childhood teacher assistants, both representing increases from the previous survey. The primary reason reported for early childhood teacher departure was "dissatisfied with pay"; which is consistent when compared to the predominant reasons cited in past surveys (with the exception of FY11). Other principal reasons reported for staff departure included dissatisfaction with benefits, found a new job either in another center, a public school, or in another field, and terminated or fired. As many of these reasons were endorsed at a similar rate by directors, it suggests that the reasons for turnover are usually complicated, especially since many directors also rated each reason for leaving by indicating there was a "personal reason" associated with the staff departure. Since data for this survey are gathered from directors or other administrative staff and not the departing staff member, having staff directly respond with their reasons for leaving might yield richer findings. In the past two years, 40.3 percent of family child care practitioners considered closing their child care home; nearly one in five did. Dissatisfaction with salary and benefits, and "too little respect for child care providers" were the predominant reasons reported. Even with the turnover challenges, two positive factors can be highlighted. First, there has been an increase over the last several years in the percentage of child care center instructional staff that are reported to be fluent in a language other than English. In 2011, this represented 10.5 percent of instructional staff and with this survey was up to 16 percent. Second, the percentage of IDCFS-qualified applicants for early childhood teacher and assistant positions both increased from the previous report, from 39.7 to 45.4 percent and 59.5 to 65.2 percent, respectively. When it comes to compensation, patterns of compensation for center positions were varied. Per the FY 2017 survey, the hourly wages of administrative directors saw an increase from the FY 2015 survey. This may be due to the fact in FY 2015, data for "director/teacher" positions had been included with the overall "administrative director" category and may have artificially lowered the hourly wage data. Hourly wages for early childhood teachers, early childhood assistants, school-age teachers, and school-age assistants had slight increases compared to the previous reporting period. The median hourly wage for an early childhood teacher in 2017 was $12.50, as compared to $12.00 in 2015, $11.04 in 2013, $11.50 in 2011, $11.00 in 2009, and $12.00 reported in 2007. Assuming a full-time early childhood teacher position equals 40 hours per week, 52 weeks per year, gross annual salary would equal $26,000. This represents more than twice the median net earnings of licensed family child care providers whose 2017 reported earnings were $12,000. This is lower than the $13,000 reported in 2013 and 2015. Wages differed substantially in centers around the state. Early childhood teachers employed in Carterville (located in southern Illinois) earned a median hourly wage of $9.58 per hour compared to early childhood teachers in Addison (located in northern Illinois) who earned a median hourly wage of $13.50, a difference of nearly $4.00 per hour. Level of education also mattered, as teachers with more education earned more than those without degrees. Moreover, teachers who majored in early childhood education (ECE) or child development (CD) and obtained an associate, bachelor's, or master's degree, earned more than teachers with a degree in another field. In addition to the low wages of the child care workforce, the benefits are also meager. Although at least 75 percent of centers reported offering paid vacation, holidays and sick leave, only 51.1 percent offered health insurance, and 44.8 percent offered a retirement/pension plan. Life insurance was offered by only 43.8 percent of centers. While centers may provide benefits to employees as part of their compensation, family child care practitioners must pay for their own. Although 94.5 percent of family child care providers were covered by a health plan, many received coverage through their spouse's employer. Other benefits are modest for family child care providers who reported being closed only a median of 14 days per year. While 75.9 percent charged when closed for holidays, only 57.7 percent charged when closed for vacation. Substantially fewer charged when closed for sick days or training days. Providers indicated that they did not charge when closed because they were sensitive to their clients' financial situations and they did not think their clients would pay. As in past Salary and Staffing Surveys, low wages and poor benefits were voiced to be a major concern by all survey respondents. Aside from the obvious financial stress these factors create for providers, they underscore a lack of value and respect for the child care labor force. These dynamics continue to be a driving force for turnover in the child care field. Throughout the survey, while providers and administrators repeatedly described their love of and dedication to children and their development, they also admitted that they need to make a living. In the end, many expressed pessimism about the child care field and a plea for help to supplement income, educate parents, and provide benefits. If these survey results and comments have any predictive value, it may be to forecast a continuing ambivalence toward the profession among practitioners at all levels of the child care workforce. In spite of these somber findings, survey results also indicate there are some reasons for optimism. First, the percentage of child care centers in Illinois that closed their doors due to "insufficient enrollment" between July 1, 2016 and June 30, 2017 was 8.4 percent, down from 9.9 percent during the same period two years prior. Second, the frequency of directors and family child care providers who are aware of Gateways to Opportunity programs and other support programs suggests that there is more awareness of the resources and options that some centers and providers are able to access that provides some compensation for lower wages and benefits in the field of child care. Third, the availability and usage of online training opportunities is apparent in the survey results, as family child care providers reported that online training was their principal source of training. Nearly three quarters reported using online training, which represents a significant increase from the 55 percent and 35.1 percent reported in the previous two surveys. In addition, 79 percent of center directors responded that there are adequate training opportunities available. This is a large increase from the 61 percent in 2013, and a possible explanation may be due to the increased availability of online training, especially those freely available through the IDHS-supported Gateways to Opportunity i-learning System. Several statewide programs support provider education and help reduce turnover. Survey respondents acknowledged these to be valuable supports to the child care field. The Gateways to Opportunity Scholarship Program awards partial college scholarships for both center and family child care practitioners to further their education in early childhood or school-age care. The Great START wage supplement program offers a stipend every six months to center and home-based providers based on their educational achievements (as long as they remain at their present place of employment). ExceleRate Illinois enhances the income of programs which provide quality care to CCAP enrolled children by providing a supplemental add-on to the CCAP reimbursement rate. Participating programs also receive support and recognition for their commitment to providing quality child care. The Gateways to Opportunity Credentials recognize the education, experience, and professional contributions of early childhood practitioners. The ExceleRate Circles of Quality, above the Licensed Circle, require that a percentage of personnel have achieved a Gateways Credential. Such programs can help improve the compensation possibilities of practitioners, thus leading to lower turnover and ultimately higher quality of child care in Illinois. When attendance falls below 50 children. Day care centers licensed for 50 or fewer children, or half-day programs with children attending no more than 3 consecutive hours per day regardless of capacity, may employ a child care director who also serves as a member of the child care staff. When the director serves in both capacities, he or she must meet the qualifications of both the director position and the teaching position. When the director attends to non-teaching responsibilities, his or her group must be supervised by a person qualified to be in charge of a group. The child care director shall be at least 21 years of age. The child director shall have a high school diploma or equivalency certificate (GED). Completion of a credentialing program approved in accordance with Appendix G of this Part, completion of 12 semester or 18 quarter hours in courses related to child care and/or child development from birth to age 6 at an accredited college or university, and 2 years (3120 clock hours) child development experience in a nursery school, kindergarten or licensed day care center. Two years (3120 clock hours) of child development experience in a recreational program, kindergarten, or licensed day care center serving school-age children, or licensed exempt school-age child care program operated by a public or private school, 30 semester or 45 quarter hours of college credits with 10 semester or 15 quarter hours in courses related directly to child care and/or child development, elementary education, physical education, recreation, camping or other related fields, and proof of enrollment in an accredited college or university until two years of college credit have been achieved. A total of 18 semester or 27 quarter hours in courses related directly to child care and/or child development, elementary education, physical education, recreation, camping or other related fields, including courses related to school-age children, is required to be obtained within the total two years of college credits. Completion of a training program accredited by the American Montessori Society or Association of Montessori International may be substituted for the courses directly related to child care and/or child development required by this Section. Persons holding a Montessori pre-primary credential may serve as director to children through age six. Persons holding a Montessori primary or elementary credential may serve as director to children six years of age or older. Persons who were deemed qualified to serve as a child care director prior to January 1, 1985, continue to be deemed qualified for their position. The school-age director and each site coordinator shall be at least 21 years of age. At least 1560 clock hours of child development experience in a recreational program or a licensed day care center serving school-age children. 1560 clock hours of experience in a recreational program or licensed day care center serving school-age children or license exempt school-age child care program operated by a public or private school and either 6 semester hours or 9 quarter hours of credit from an accredited college or university related to school-age child care, child development, elementary education, physical education, recreation, camping or other related fields. The child care director must successfully complete a basic training course of 6 or more clock hours on providing care to children with disabilities that has been approved by the Department. The day care center shall have on file a certificate attesting to the training of the child care director. Persons employed as a child care director shall complete this training within 36 months from date appointed as child care director. A child care director who has completed training prior to employment may have that training approved as meeting the provisions of this subsection (k). A certificate of training completion and a description of the course content must be submitted to the Department for approval. A child care director who obtains approved training and moves from one day care facility to another shall not be required to take another training course as long as the child care director can provide documentation in the form of a certificate that the training was completed. Early childhood teachers and school-age workers shall be at least 19 years of age. Early childhood teachers and school-age workers shall have a high school diploma or equivalency certificate (GED). Completion of credentialing programs approved by the Department in accordance with Appendix G of this Part. School-age workers shall be at least 19 years of age and at least five years older than the oldest child with whom they work. A high school diploma or equivalency certificate plus 3120 clock hours of experience in a recreational program, kindergarten, or licensed day care center serving school-age children or a license exempt school-age child care program operated by a public or private school. Completion of a training program accredited by the American Montessori Society or Association Montessori International may be substituted for the courses directly related to child care and/or child development required by this Section. Persons holding a Montessori pre-primary credential may supervise children through age six. Persons holding a Montessori primary or elementary credential may supervise children six years of age or older. Persons who were deemed qualified as a child care worker or school-age worker prior to January 1, 1985, continue to be deemed qualified as an early childhood teacher or school-age worker. Early childhood teachers and school-age workers shall be responsible for the planning and supervision of a group of children. Early childhood workers and school-age workers shall also be responsible for supervising persons assigned to assist their group who are not similarly qualified. Early childhood assistants shall meet the requirements of Section 407.100, with the exception of subsection (b). Early childhood and school-age assistants shall have a high school diploma or equivalency certificate (GED). Early childhood assistants shall work under the direct supervision of an early childhood teacher or school-age worker and shall not assume full responsibility for a group of children, except as allowed by Section 407.190(e)(2). School-age assistants shall work under the direct supervision of a school-age worker and shall not assume full responsibility for a group of children, except as allowed by Section 407.90(e)(2). We gratefully appreciate the support of the Illinois Department of Human Services and its Bureau of Child Care and Development for the opportunity to conduct these analyses, and for proofreading earlier drafts of this report and making important editorial comments.